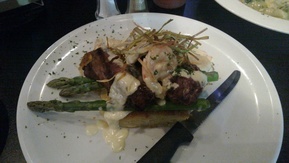 Above standard suburban pub - nice looking food and good considering its location. 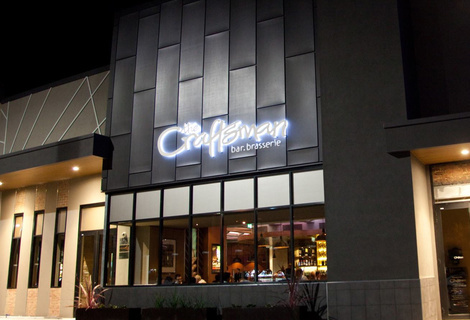 The Craftsman was reviewed on Wednesday 9th October 2013 19:00 by Elena. We went down on a normal night of the week to get to Perth's only IMAX - something never more worth doing than to see the movie 'Gravity'. We were looking for somewhere to kill some time, maybe have a quiet beer and have some food before the film. For this purpose, this modern suburban pub/bistro fit the bill adequately. The most defining factor of this establishment is that it is in the cinema/sit-down-restaurant district of a quite large suburban mall. It was findable enough within the mall complex with a large recently done frontage facing the highway, right at the foremost carpark. There is some front entry seating, which we took advantage of as the weather was perfect per usual; this seating has an indoors/outdoors feel as it's quite a large atrium that it shares with a few other establishments near a large entrance. This had the benefits of being sheltered from the insects and elements, yet you could almost be confused in to thinking you were actually outside due to the airiness and mainly natural lighting. You could also almost forget you're actually sitting in a mall. Almost. On this normal weekday night business was humming along. Sharing the partially filled atrium area were some guys in outdoor-work clothes having some afterwork beers and a table of dolled up ladies having a girl's night out. It was populated to about the perfect degree: that is not too many people that you feel crowded in upon nor so few that you start to feel worried - it felt bustling to a pleasant degree. There was plenty more capacity too which would undoubtedly be filled on their busier days. Service was stock-standard: staff, while findable, were a bit dry and robotic. There seemed to be table-service inside which we can't report on, there was minimal staff intervention outside. The beer selection was more-or-less standard - on tap a range of the "boutique" CUB beers and ciders such as Redback, Fat Yak and some Cascade beers with some foreign beers for good measure such as Millers, Hoegaarden and Stella. The beer was neither cheap nor expensive with most of the selection at $8-$10 per pint there was nothing unexpected here. The menu was ho-hum looking. The outside menu was presented on a quite tacky (literally a bit sticky) menu holder stand, no pleather-covered books outside. The pricing was at the higher side, but well within the bounds of what we expect here in Perth. The soup selection wasn't great at all and the mains selection were the predictable pedestrian Steak, Fish, Pork, Pasta, Salad, etc choices ranging between $20-$35. 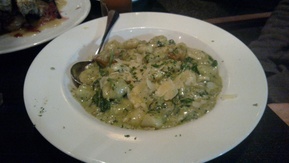 We chose the Surf-and-Turf, Gnocci and Pork Belly, which arrived quickly enough though badly out-of-sync. We all sat politely staring at 2 of the rapidly cooling dishes for the best part of 10 minutes before the full complement arrived. 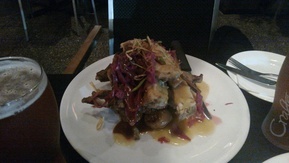 Although on the plus side the food was presented spectacularily, we were quite wow-ed and it exceeded our expectations. The sheen of the presentation was taken off a little by the tiny table, mall-like ambiance and delayed service, but the Pork Belly in particular looked amazing. Despite the presentation the dishes weren't that flavorsome. It's worth noting also that if we'd chosen to eat inside in the civilised air-conditioned bistro/restaurant - some of the forementioned gripes would have been allayed. Once the venue was explored to the back the factilities turned out to being quite decent with a pool table, modest corner stage and nicely new and spotless WCs. It's be easy to imagine spending an idle arvo or evening listening to a local muso doing some "Khe San" while sinking some fresh cold ones amongst some pleasant and normal suburban rowdiness. Above average - tidy, clean and better than some places. The ambiance is a little franchise-like with neutral patterned decor that we've come to expect, this coupled with it's suburban locale gave it almost an RSL feel. A utilitarian and perfectly satisfactory pub/bistro.